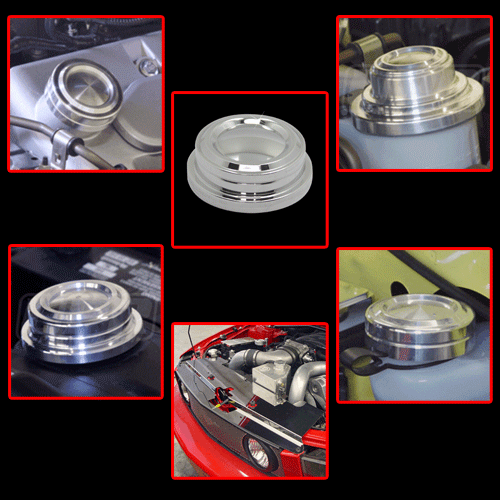 * Show Quality Mirror Polished Finish Package Savings! UPR's Newest addition to let you dress your car up at prices anyone can afford. We won't put our logo on it and bring the price up like the competition. UPR's Billet Underhood Dress Up kit will give your Mustang's engine bay the Shine and Touch of Class it deserves. This kit was put together by UPR with the following components: * 1 UPR Billet Brake Fluid Cap cover * 2 UPR Billet Windshield Washer Cap Cover * 3 UPR Billet Oil Cap Cover * 4 UPR Billet Power Steering cap cover * 5 UPR Billet Radiator Cap Cover * 6 UPR Stainless Steel Radiator Cover Quality Construction: Custom CNC Machined from Billet Aluminum for a perfect fit, including a Diamond cutter final pass giving our parts the best finish possible. No one else can Stack up to the bold clean styling of our aftermarket Billet / Stainless Steel Dress Ups, Street / Strip / Racing Suspension and Performance Parts for your American Muscle Car! Installs in 30 minutes with silicone adhesive (not included). Fits these Vehicles: 2005 2006 2007 2008 2009 Ford Mustang GT 4.6L Bullitt Shelby Mustang Roush & Saleen Vehicles. Made in the USA!